Mount Robson Park provides representation of all the North Continental Range landscapes. The park protects multiple complex ecosystems, represented by four bio-geo-climatic zones. These ecosystems are called Interior Cedar Hemlock (ICH), located in the valley bottoms, Sub-boreal Spruce (SBS), Englemann Spruce-subalpine Fir (ESSF) and finally up slope to the Alpine Tundra (AT) zone. The vegetation communities change as the elevation increases. As the vegetation changes, so does the wildlife. The diversity of species inside the park is a product of the diverse elevations. 182 species of birds are present in the park. Predator and prey relationships remain undisturbed by human interference in 80% of the park-zoned wilderness area. In fact, vast areas are zoned for wilderness conservation, meaning human use is not encouraged in any way – not even through the development of trails. The beauty of Mount Robson wilderness is preserved for generations to come. The park believes (and rightly so) the most important “customers” in these large wilderness areas are the wide variety of flora and fauna that depend on an undisturbed, intact wilderness. In addition to protecting the largest peak in the entire Canadian Rockies, Mount Robson also protects beautiful, expansive alpine areas, clear rivers, lakes and highly valued wetland habitat. While towering mountains and imposing rock formations inspire and awe we humans, the main feature of the park, from a conservation perspective, is the headwaters of the Fraser River. The Fraser River is of one of the world’s great rivers. Within the park, however, it is no more than a small, crystal clear creek. Believe it or not, this is the same river that empties into the Pacific Ocean, over 1,200 kilometers away in Vancouver. The very source of the great river lies in the south east corner of the park in Fraser Pass. Imagine drinking water from the very of start of one of the great rivers on this planet. Future generations will no doubt be grateful we protected over 100 kilometres of the Fraser River’s headwaters within Mount Robson Park. There is little we love more than this glorious landscape and all the wildlife that finds sustenance here. 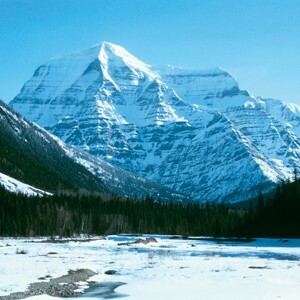 That is why we started our bed and breakfast in the shadow of Mount Robson, minutes from the Berg Lake trail. We also have stand alone cabins. We hope to see you finding solace here this spring.